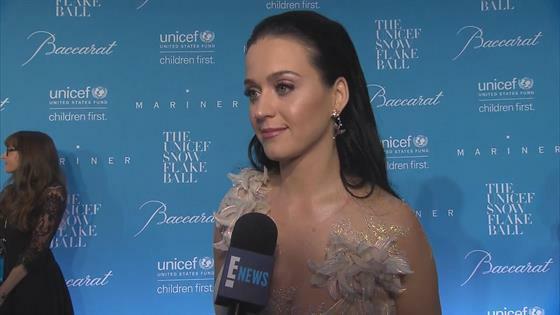 Katy Perry Says Orlando Bloom Has "The Most Kind Heart"
Katy Perry has one of the biggest hearts in Hollywood. Of course, the same could be said of Orlando Bloom, her boyfriend of nearly a year. Perry, an ambassador for UNICEF since 2013, gushed about the actor before she was honored at the organization's Snowflake Ball in New York City Tuesday. "It's so funny: He was the previous award recipient," the singer told E! News exclusively. "He's just got the most kind heart ever." Perry, who previously participated in field visits to Madagascar and Vietnam and raised over $1 million for UNICEF through her Prismatic World Tour, also discussed her personal connection to the organization. "With UNICEF, I go on the field and I'm in those situations, and I'm with those kids and I'm in the poverty. I'm in the helplessness. I'm in the sadness. I feel it. I absorb it so much," the "Dark Horse" singer told E! News. "I try to take my light—whatever kind of global light of I have, whether it's on social media or any kind of influence—I try and steer that to what those people need and just bring awareness. This is just the beginning, and I'm really honored." "Sometimes I'm like, 'I shouldn't be getting an award this early on,'" Perry confessed. "But I think it's really a symbol and a sign for me to always continue to be like, 'Get your bum on the field. You've been living in your bubble for too long. Go out there and do work that matters.'" The gala dinner, hosted at Cipriani Wall Street, also honored Moll Anderson. Inside the event, Bloom beamed with pride as Hillary Clinton made a surprise appearance to honor his Marchesa-clad girlfriend. "On a personal level I cannot tell you how delighted I am to be here, to help celebrate the recipient of this years Audrey Hepburn Humanitarian Award," the politician began. "Someone who just has the spirit and the energy and the compassion that Audrey Hepburn brought to her work for UNICEF. Someone whose powerful voice and creative lyrics remind us when you get knocked down to get back up. Someone who as you saw in the video is a deeply committed humanitarian. We need champions like Katy now more than ever." "I have seen Katy's commitment to the causes she believes in firsthand," Clinton said of Perry, who publicly campaigned on her behalf. "I've gotten to spend time with her and I know how deeply she cares about making our world a better place. She is serious about understanding the complex problems we face and pulling people together to solve them. We need champions like Katy now more than ever: her passion, her energy and, yes, her voice—louder than a lion." "Katy Perry, congratulations," Clinton said. '"And thank you so much." After Perry took the stage, she jokingly asked the ballroom, "Does anyone have a tissue?" "We were all children at one time: born innocent, vulnerable, fragile. And we all needed a helping hand to grow into the people that we are today," Perry said in her speech. "If we could keep that thought in our hearts, despite our differences, imagine the kindness, acceptance and empathy that would light the world and remind us once again that we're all in this together." "Truly, my work has only just begin and this award is not a finish line, but a starting line. It will be constant reminder to get back in the field and shine my spotlight on where it matters most."